Of course, Nolan has shielded himself behind the same level of secrecy director J.J. Abrams did with the last Star Trek feature. Spoiling the movie in order for someone to make his or her criticism only invites the wrath of Nolan's built-in cult audience. Keep things vague and the same type of fan is provoked into attacking one as a Nolan-hater despite the fact that with one of the smallest filmographies around, Nolan has already risen to the top of the heap of promising directors primarily on the basis of critical goodwill showered on him after movies like Memento and The Dark Knight. How Interstellar unfolds depends strongly on its secrets so it shall be necessary to avoid spoilers here. 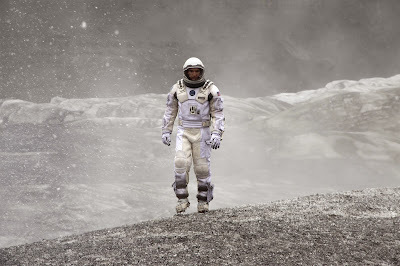 Most of what appears in Interstellar's promotional material takes place in the first third of the film, where one learns that an apocalyptic blight has been spreading throughout or planet for at least a generation. Earth is big, grey dust bowl, which only adds to the distaste former test pilot Cooper (Matthew McConaughey) already has for farming. A widowed dad, Coop's forced exile into what has become a rural world, both in its isolation and its mentality, also brings him at odds with his bright young daughter Murph (Mackenzie Foy) and his father-in-law (John Lithgow). They both understand Cooper's reluctance to accept the school system's authority when it comes to teaching that the entire Apollo program was a hoax. But they don't get why Coop must be so strident about it that he gets his daughter suspended and the family ostracized for flying in the face of the prevailing dogma. In what is a hokey stack of contrivances, McConaughey plays a uniquely American hero in Coop, an explorer who is independent enough to chafe against authority, refusing to be a part of the wave of anti-science spreading over a country that was once known for leading the charge in innovation, but still turning to agriculture and then space exploration in order to save his daughter and the rest of humanity. Whatever Interstellar's issues are, McConaughey at least gets another great role out of it. 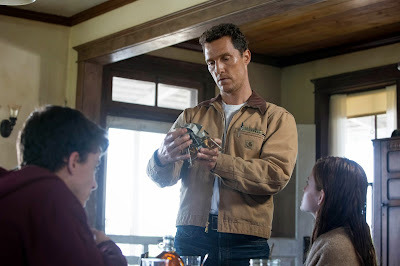 McConaughey plays well off Foy, the promising talent who plays young Murph, forging a father-daughter bond that serves as the foundation for Interstellar's dimension-spanning story. It's not an easy thing for a movie that depends so much on hard science to fuel its early, cerebral premise to be motivated so successfully by human emotions. McConaughey and the rest of the cast get us to care, as does Jessica Chastain in her small but pivotal part as the adult Murph later on. Unfortunately, just as Nolan launches Interstellar into space, the movie begins to fall apart. Separating Coop from his daughter may be necessary for Interstellar to advance, but it also forces Nolan to overcompensate by beginning to favor schmaltzy, New Age platitudes over the alluring scientific premise that may attract much of the movie's audience in the first place. It's as if the gulf of time and space that keeps McConaughey and Chastain from acting opposite each other onscreen also causes Nolan to lose his bearings. A pair of robots (whose design is one of the movie's most inspired) take a while to register as such because of the weird way Nolan places his camera to introduce them in conjunction with the method in which he presents the disembodied voices meant to emanate from the automatons. Leaps in logic are delivered in run-on sentences by an able cast of astronauts (that include Anne Hathaway and Wes Bentley) that hope you won't notice they don't know what they're talking about. Nolan begins to rely too much on initially exhilarating and propulsive scenes of McConaughey travelling into the unknown a la Keir Dullea in 2001, ad nauseam. But to what end? What 2001's Dullea finds on the other side blows your mind. What McConaughey finds in Interstellar will only have you scratching your head.